Includes 251 spacious casitas with stunning views on 40 acres of lush hibiscus gardens on a hillside high above famous Acapulco Bay. 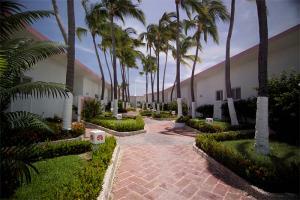 Each casita has its own private or semi-private pool, terrace and fully-stocked mini-bar. Brisas Beach Club: Complimentary daily continental breakfast, cocktail hour with hors d'oeuvres and upgraded room amenities. Nestled in the hills overlooking Acapulco Bay, 20 minutes from the airport. Bellavista Bar, La Concha Beach Club, Deli Shop, and In Room Dining.